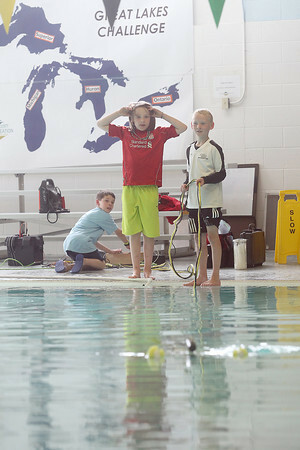 From left, Lee Forton (Cq), Gavin Hysell (cq) and Henrik Buttleman (Cq), all 9, of the Willow Hill Falcons operate their remotely operated vehicle, or ROV, at Easling Pool at the Grand Traverse County Civic Center Saturday in to practice for the upcoming Great Lakes Regional Mate ROV Competition May 17 in Alpena. The event will feature 39 teams from around the Great Lakes region competing to complete three tasks involving science, conservation and exploration challenges on a fake shipwreck on a pool bottom for a chance to qualify for the international competition in June. This is the first year the Great Lakes are featured in the competition, which is hosted by the Thunder Bay National Marine Sanctuary.